The 2017 recreational Pacific halibut fishery will commence Monday, May 1 for the first of four open periods. This season’s dates are May 1-June 15, July 1-15, Aug. 1-15 and Sept. 1-Oct. 31, or until the quota is reached, whichever is earlier. The open and closed periods are intended to provide fishing opportunities from spring through fall. The 2017 Pacific halibut quota for the California subarea is 34,580 pounds – about 5,000 pounds more than the 2016 quota. During the annual rulemaking process, California Department of Fish and Wildlife (CDFW) received input expressing interest in maintaining the 2016 season dates, but also adding additional open fishing days in 2017 that align with holiday weekends. In response, and in light of the increased quota, CDFW recommended a longer open season to the National Marine Fisheries Service which included Memorial Day weekend, in addition to Independence Day and Labor Day weekends. The season dates are expected to continue to meet the goal of providing as much opportunity throughout the season while ensuring the quota is attained. As in 2015 and 2016, the open dates are not guaranteed days, and the season could be closed early if it is determined that projected catches will exceed the California quota. Again this year, field staff will be stationed at public launch ramps and charter boat landings to monitor catches of Pacific halibut along with other marine sportfish. CDFW will examine this information in comparison to expected catch rates and if the cumulative catch is expected to reach or exceed the quota prior to Oct. 31, a closure date will be determined and the public will be notified. The public can follow the progress of catch through the season on the CDFW Pacific halibut website, which will be updated weekly with the latest catch projection information (see link below). The California Department of Fish and Wildlife (CDFW) announces the recreational Pacific halibut fishery will close Saturday, Sept. 24 at 12:01 a.m. for the remainder of 2016. Based on the latest catch projections, CDFW expects the 2016 quota of 29,640 pounds will be exceeded unless the fishery is closed. Formal authority to close the fishery resides with the National Marine Fisheries Service (NMFS), which took action to close the fishery following consultation with CDFW. Beginning in 2015, CDFW committed to tracking the fishery in-season to ensure catch amounts would not exceed the California quota. The quota amount is determined annually in January through an international process, and is largely driven by results from the annual stock assessment conducted by the International Pacific Halibut Commission (IPHC). 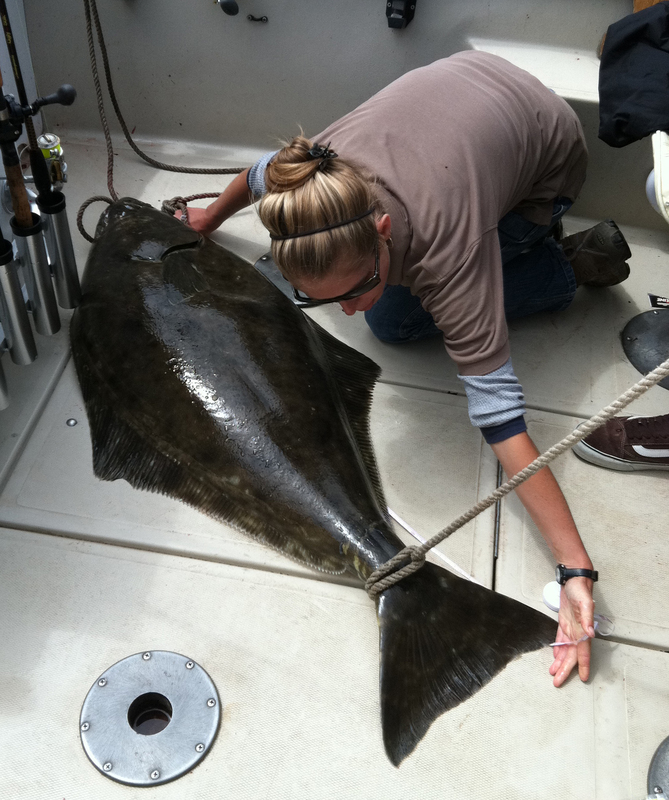 California’s recreational Pacific halibut (Hippoglossus stenolepis) fishery season will open May 1. This year the fishery will be held to a federally established quota of 29,640 pounds. The open season dates will be May 1-15, June 1-15, July 1-15, Aug. 1-15 and Sept. 1-Oct. 31, or until the quota is reached, whichever is earlier. The open and closed periods are intended to spread fishing opportunities from spring through fall. Anglers are limited to one rod and two hooks while fishing for Pacific halibut. Again this year, California Department of Fish and Wildlife (CDFW) field staff will be stationed at public launch ramps and charter boat landings to monitor catches of Pacific halibut along with other marine sportfish. CDFW will examine observed catch information and compare it with expected catch rates. As the season progresses, CDFW will confer with the National Marine Fisheries Service (NMFS) and International Pacific Halibut Commission on expected quota attainment. If the cumulative catch is expected to reach or exceed the quota prior to Oct. 31, NMFS will close the fishery. The 2016 quota is an increase of 4,420 pounds over the 2015 quota. The public can follow the progress of catch through the season by viewing the Pacific halibut thermometer on the CDFW Pacific halibut website, which will be updated weekly with the latest catch projection information. Anglers in northern California are also advised to check the open season dates for ocean salmon when planning fishing activity in the Eureka, Trinidad and Crescent City port areas. Due to the low forecasted ocean abundance of Klamath River Fall Chinook, periodic recreational salmon closures have been implemented in these areas for 2016. During May, June and July, anglers will have the opportunity to target either Pacific halibut or ocean salmon, but not both species concurrently.